A blue crab with two oysters attached by its eyes was found in a crab pot off Tangier Island, VA. Anyone who has been fishing or crabbing can attest that half the fun is the thrill of not knowing what exactly is on the end of the line or in the pot. Tangier Island Mayor James "Ooker" Eskridge, a full-time waterman, must have pulled tens of thousands of crab pots in his lifetime. But recently, he discovered a critter beyond belief. As we've written about before, the Bay is full of surprises. But Eskridge and the entire Bay-loving world was blown away at the site of a two-year old blue crab with two six-month old oysters growing right on its shell. 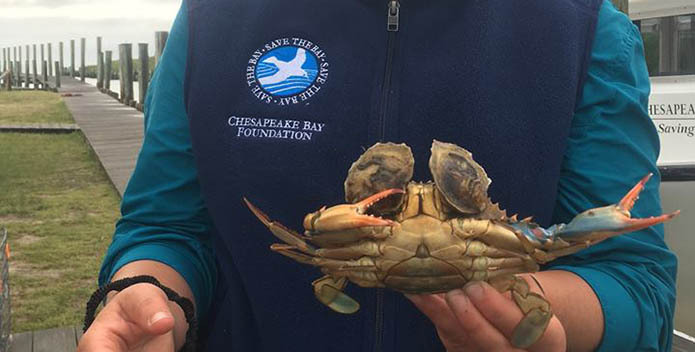 A Chesapeake Bay "Turducken" of sorts, this critter combines two of the Bay's most beloved critters—blue crabs and oysters. While it isn't very rare to find a living blue crab with living oysters attached to it, it is rare for the oysters to grow to this size. But the discovery of this unusual critter is emblematic of a larger issue. Baby oysters, called spat, need a hard surface to attach onto and grow. The ideal surface are old oyster shells and oyster reefs. However, after decades of pollution, disease, and overharvesting, the Bay's native oyster population is a small fraction of its previous size. Concerted efforts are underway to resurrect the Bay's native oyster population with support from Bay states and the federal government to build oyster sanctuaries. But much of the federal funding for these critical oyster restoration efforts are under threat. 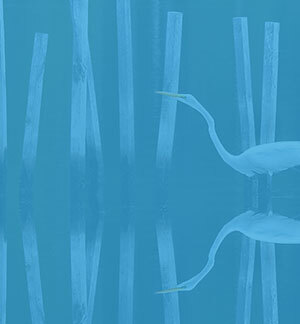 With the entire Clean Water Blueprint in jeopardy, it's critical you tell Congress loud and clear that it must stand up to protect clean water in the Chesapeake Bay. We're working to Save the Bay not only for all the critters that call it home, but to conserve it so future generations can experience its benefits—from expanded recreational opportunities, improved public health, massive economic benefits, and yes, even the wonder of discovering a Bay turducken. Throughout Virginia: Join us for the 29th annual Clean the Bay Day! One of the largest volunteer efforts in Virginia, roughly 6,000 volunteers remove more than 100,000 pounds of harmful debris from Virginia's waterways and shorelines. With sites all across the Commonwealth, there are plenty of opportunities to get involved. Click here to learn more and register! Annapolis, MD: Oyster gardeners are invited to return the oysters they have so diligently grown so CBF can plant them on sanctuary reefs, where they can live, filter, and reproduce happily among other oysters. Learn more! Easton, MD: The Clean Water Concert Series is back! Kick off the summer with an evening of Latino music and delicious ethnic food sold by street vendors! Cantaré draws from the musical heritage of the Caribbean and Central and South America to perform an entertaining blend of songs in Spanish and Portuguese, while sharing the rich cultural history of the music. The Shore's Latino community and all others welcome! The concert is free and open to the public. While enjoying the music, be sure to stop by the dozens of environmental and community exhibits, including CBF's, so that you can learn more about the Bay and how you can be a part of the movement to restore it. Learn more! Easton, MD: Oyster gardeners are invited to return the oysters they have so diligently grown so CBF can plant them on sanctuary reefs, where they can live, filter, and reproduce happily among other oysters. Learn more! Solomons, MD: Oyster gardeners are invited to return the oysters they have so diligently grown so CBF can plant them on sanctuary reefs, where they can live, filter, and reproduce happily among other oysters. Learn more! Easton, MD: The Clean Water Concert Series continues with the U.S. Navy Band Sea Chanters. The Navy's official chorus performs pieces ranging from Broadway tunes to sea chanteys and everything in between. Top-notch entertainment you won't want to miss! The concert is free and open to the public. While enjoying the music, be sure to stop by the dozens of environmental and community exhibits, including CBF's, so that you can learn more about the Bay and how you can be a part of the movement to restore it. Learn more!